The annual Honey Gold mango harvest is underway in the Northern Territory with the first fruit of Piñata Farms' own variety, set to arrive in stores nationally tomorrow. Key account manager Rebecca Scurr said Piñata Farms expected a consistently strong season, following last year's record season for Honey Golds and Australian mangoes generally. "As mangoes can sometimes show some biennial tendencies, it’s not often we would experience two bumper years in a row. However, all the signs are there for another great season with excellent quality fruit in abundance due to good flowering and fruit set during winter, followed by an ideal, dry spring," Ms Scurr said. "After a big season when trees hold a large crop, they do need time to recover nutritionally. All mango varieties are the same in this regard, but Honey Golds tend to have a more consistent crop, year after year." The Australian mango industry sent a record 10.7 million trays to market in the 2017-2018 season. Piñata Farms experienced an increase of approximately 30 per cent on the previous season. 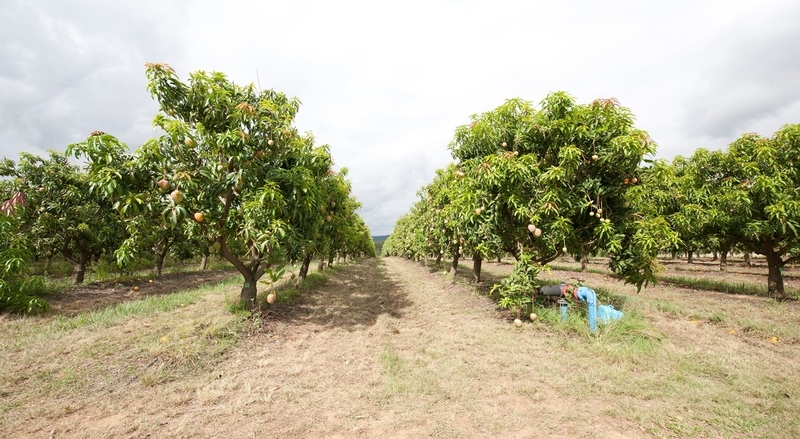 Piñata Farms and some 30 contracted growers in the Northern Territory, Queensland, New South Wales, Victoria and Western Australia produce the specialty mango between November and March every season. Picking began at Katherine, in the Northern Territory in early November and will wrap up in Mildura, Victoria by the end of March. A total of 120 workers, including 30 people from Vanuatu, recruited under the Federal Government's Seasonal Worker Programme, are required for picking and packing this year's harvest. Nine years after it was first commercialised, the proprietary Honey Gold variety now accounts for approximately 10 per cent of the Australian mango market. "Because many Australians now say Honey Gold mangoes are their favourite, we have progressively expanded plantings on our own farms in the past three years. These trees will reach full production by 2024," Ms Scurr said. Piñata Farms now had some 300 hectares of trees under cultivation at its Darwin, Katherine and Mataranka farms in the Northern Territory including new plantings of about 18,000 trees since last season, she said. Ms Scurr said consumers could expect consistent quality fruit with a typically punchy flavour. "Honey Golds are best when they are 100 per cent orange and yield a little when touched. At 500-600 grams a piece, Honey Gold mangos also have a small seed-high flesh ratio." Honey Golds mangoes are available at leading supermarkets and independent retail outlets nationally where they are sold loose. This season all labels on Honey Gold mangoes will include a barcode denoting the specific packhouse of origin. Based on global standards, GS1 barcode numbers are now required by Australian retailers to aid traceability. Piñata Farms' Queensland headquarters at Wamuran, on the Sunshine Coast, handles the ripening and distribution for all Queensland-grown fruit. More than 20 packhouses throughout the growing regions pack Honey Golds mangoes. Honey Gold mangoes are picked green and ripened under controlled conditions before distribution. The Piñata Farms team will join other mango growers from around Australia when the industry celebrates mango season at the annual Mess-tival at North Bondi Surf Life Saving Club, North Bondi, New South Wales, on December 2.